Proprietary Name: Spravato What is the Proprietary Name? Non-Proprietary Name: Esketamine Hydrochloride What is the Non-Proprietary Name? 50458 - Janssen Pharmaceuticals Inc.
Spravato with NDC 50458-028 is a a human prescription drug product labeled by Janssen Pharmaceuticals Inc.. The generic name of Spravato is esketamine hydrochloride. 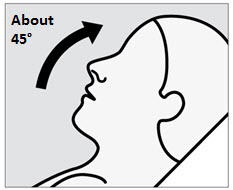 The product's dosage form is solution and is administered via nasal form. Labeler Name: Janssen Pharmaceuticals Inc.
Nasal - Administration to the nose; administered by way of the nose. FDA Application Number: NDA211243 What is the FDA Application Number? SedationPatients are at risk for sedation after administration of SPRAVATO [see Warnings and Precautions (5.1)]. DissociationPatients are at risk for dissociative or perceptual changes after administration of SPRAVATO [see Warnings and Precautions (5.2)].Because of the risks of sedation and dissociation, patients must be monitored for at least 2 hours at each treatment session, followed by an assessment to determine when the patient is considered clinically stable and ready to leave the healthcare setting [see Warnings and Precautions (5.1, 5.2)]. Abuse and MisuseSPRAVATO has the potential to be abused and misused. Consider the risks and benefits of prescribing SPRAVATO prior to use in patients at higher risk of abuse. Monitor patients for signs and symptoms of abuse and misuse [see Warnings and Precautions (5.3)].Because of the risks of serious adverse outcomes resulting from sedation, dissociation, and abuse and misuse, SPRAVATO is only available through a restricted program under a Risk Evaluation and Mitigation Strategy (REMS) called the SPRAVATO REMS [see Warnings and Precautions (5.4)]. Suicidal Thoughts and BehaviorsAntidepressants increased the risk of suicidal thoughts and behavior in pediatric and young adult patients in short-term studies. Closely monitor all antidepressant-treated patients for clinical worsening, and for emergence of suicidal thoughts and behaviors. SPRAVATO is not approved in pediatric patients [see Warnings and Precautions (5.5)]. Limitations of Use:SPRAVATO is not approved as an anesthetic agent. The safety and effectiveness of SPRAVATO as an anesthetic agent have not been established. Blood Pressure Assessment Before and After Treatment Assess blood pressure prior to dosing with SPRAVATO [see Warnings and Precautions (5.6)]. If baseline blood pressure is elevated (e.g., >140 mmHg systolic, >90 mmHg diastolic), consider the risks of short term increases in blood pressure and benefit of SPRAVATO treatment in patients with TRD [see Warnings and Precautions (5.6)]. Do not administer SPRAVATO if an increase in blood pressure or intracranial pressure poses a serious risk [see Contraindications (4)]. After dosing with SPRAVATO, reassess blood pressure at approximately 40 minutes (which corresponds with the Cmax) and subsequently as clinically warranted. 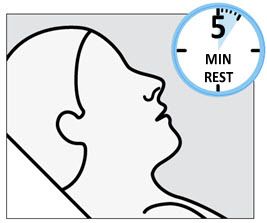 If blood pressure is decreasing and the patient appears clinically stable for at least two hours, the patient may be discharged at the end of the post-dose monitoring period; if not, continue to monitor [see Warnings and Precautions (5.6)]. Food and Liquid Intake Recommendations Prior to AdministrationBecause some patients may experience nausea and vomiting after administration of SPRAVATO [see Adverse Reactions (6.1)], advise patients to avoid food for at least 2 hours before administration and to avoid drinking liquids at least 30 minutes prior to administration. 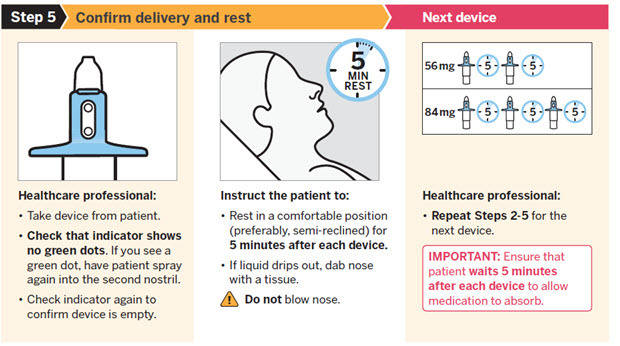 Nasal Corticosteroid or Nasal DecongestantPatients who require a nasal corticosteroid or nasal decongestant on a dosing day should administer these medications at least 1 hour before SPRAVATO [see Clinical Pharmacology (12.3)]. Short-Term Cognitive ImpairmentIn a study in healthy volunteers, a single dose of SPRAVATO caused cognitive performance decline 40 minutes post-dose. Compared to placebo-treated subjects, SPRAVATO-treated subjects required a greater effort to complete cognitive tests at 40 minutes post-dose. Cognitive performance and mental effort were comparable between SPRAVATO and placebo at 2 hours post-dose. Sleepiness was comparable after 4 hours post-dose. Long-Term Cognitive ImpairmentLong-term cognitive and memory impairment have been reported with repeated ketamine misuse or abuse. 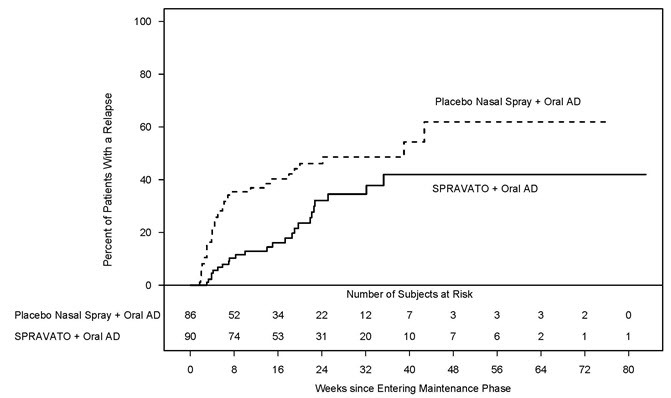 No adverse effects of SPRAVATO nasal spray on cognitive functioning were observed in a one-year open-label safety study; however, the long-term cognitive effects of SPRAVATO have not been evaluated beyond one year. Patient ExposureSPRAVATO was evaluated for safety in 1709 patients diagnosed with treatment resistant depression (TRD) [see Clinical Studies (14.1, 14.2)] from five Phase 3 studies (3 short-term and 2 long-term studies) and one Phase 2 dose-ranging study. Of all SPRAVATO-treated patients in the completed Phase 3 studies, 479 (30%) received at least 6 months of treatment, and 178 (11%) received at least 12 months of treatment. Adverse Reactions Leading to Discontinuation of TreatmentIn short-term studies in adults < 65 years old (Study 1 pooled with another 4-week study), the proportion of patients who discontinued treatment because of an adverse reaction was 4.6% in patients who received SPRAVATO plus oral AD compared to 1.4% for patients who received placebo nasal spray plus oral AD. For adults ≥ 65 years old, the proportions were 5.6% and 3.1%, respectively. In Study 2, a long-term maintenance study, the discontinuation rates because of an adverse reaction were similar for patients receiving SPRAVATO plus oral AD and placebo nasal spray plus oral AD in the maintenance phase, at 2.6% and 2.1%, respectively. Across all phase 3 studies, adverse reactions leading to SPRAVATO discontinuation in more than 2 patients were (in order of frequency): anxiety (1.2%), depression (0.9%), blood pressure increased (0.6%), dizziness (0.6%), suicidal ideation (0.5%), dissociation (0.4%), nausea (0.4%), vomiting (0.4%), headache (0.3%), muscular weakness (0.3%), vertigo (0.2%), hypertension (0.2%), panic attack (0.2%) and sedation (0.2%). 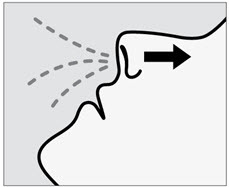 Sense of SmellSense of smell was assessed over time; no difference was observed between patients treated with SPRAVATO plus oral AD and those treated with placebo nasal spray plus oral AD during the double-blind maintenance phase of Study 2 [see Clinical Studies (14.2)]. Pregnancy Exposure RegistryThere is a pregnancy exposure registry that monitors pregnancy outcomes in women exposed to antidepressants, including SPRAVATO, during pregnancy. Healthcare providers are encouraged to register patients by contacting the National Pregnancy Registry for Antidepressants at 1-844-405-6185 or online at https://womensmentalhealth.org/clinical-and-research-programs/pregnancyregistry/antidepressants/. Risk SummarySPRAVATO is not recommended during pregnancy. There are insufficient data on SPRAVATO use in pregnant women to draw conclusions about any drug-associated risk of major birth defects, miscarriage, or adverse maternal or fetal outcomes. Based on published findings from pregnant animals treated with ketamine, the racemic mixture of arketamine and esketamine, SPRAVATO may cause fetal harm when administered to pregnant women (see Data). Advise pregnant women of the potential risk to an infant exposed to SPRAVATO in utero. There are risks to the mother associated with untreated depression in pregnancy (see Clinical Considerations). If a woman becomes pregnant while being treated with SPRAVATO, treatment with esketamine should be discontinued and the patient should be counseled about the potential risk to the fetus.Published studies in pregnant primates demonstrate that the administration of drugs that block N-methyl-D-aspartate (NMDA) receptors during the period of peak brain development increases neuronal apoptosis in the developing brain of the offspring. There are no data on pregnancy exposures in primates corresponding to periods prior to the third trimester in humans [see Use in Specific Populations (8.2)].In an embryo-fetal reproduction study in rabbits, skeletal malformations were noted at maternally toxic doses when ketamine was intranasally administered with a No Observed Adverse Effect Level (NOAEL) at estimated esketamine exposures 0.3 times the exposures at the maximum recommended human dose (MRHD) of 84 mg/day. In addition, intranasal administration of esketamine to pregnant rats during pregnancy and lactation at exposures that were similar to those at the MRHD resulted in a delay in sensorimotor development in pups during the preweaning period and a decrease in motor activity in the post-weaning period.The estimated background risk of major birth defects and miscarriage for the indicated population is unknown. All pregnancies have a background risk of birth defect, loss, or other adverse outcomes. In the U.S. general population, the estimated background risk of major birth defects and miscarriage in clinically recognized pregnancies is 2 to 4% and 15 to 20%, respectively. Disease-Associated Maternal and/or Embryo-Fetal RiskA prospective, longitudinal study followed 201 pregnant women with a history of major depressive disorder who were euthymic and taking antidepressants at the beginning of pregnancy. The women who discontinued antidepressants during pregnancy were more likely to experience a relapse of major depression than women who continued antidepressants. Consider the risk of untreated depression when discontinuing or changing treatment with antidepressant medication during pregnancy and postpartum. Animal DataBased on published data, when female monkeys were treated intravenously with racemic ketamine at anesthetic dose levels in the third trimester of pregnancy, neuronal cell death was observed in the brains of their fetuses. This period of brain development translates into the third trimester of human pregnancy. The clinical significance of these findings is not clear; however, studies in juvenile animals suggest neuroapoptosis correlates with long-term cognitive deficits.Racemic ketamine was administered intranasally to pregnant rats during the period of organogenesis at doses of 15, 50, and 150 mg/kg/day. The No Observed Adverse Effect level (NOAEL) for embryo-fetal toxicity in rats was the highest dose of 150 mg/kg/day. Estimating 50% of the exposure to be from esketamine, the NOAEL associated with esketamine plasma exposure (AUC) is 12-times the AUC exposure at the MRHD of 84 mg/day. In pregnant rabbits, racemic ketamine was administered intranasally from gestational day 6 to 18 at doses of 10, 30, and 100 mg/kg/day. The high dose was lowered from 100 to 50 mg/kg after 5 days of dosing due to excessive mortality in the pregnant rabbits. Skeletal malformations were observed at doses ≥ 30mg/kg/day, which were maternally toxic. The NOAEL for skeletal malformations was associated with a plasma esketamine exposure (AUC) that was 0.3 times the AUC exposure at MRHD of 84 mg/day.Administration of esketamine to pregnant rats during pregnancy and lactation at intranasal doses equivalent to 4.5, 15, and 45 mg/kg/day (based on a 200-gram rat) produced AUC exposures 0.07, 0.5, and 0.7 times the MRHD of 84 mg/day, respectively. Maternal toxicity was observed at doses ≥ 15 mg/kg/day. In addition, a dose-dependent delay in the age of attainment of Preyer response reflex was observed in pups at all doses during the preweaning period. This sensory/motor developmental measure was tested starting on postnatal day (PND) 9, and the effect normalized by PND 19 in treatment groups as compared with PND 14 for the majority of the control animals. There is no NOAEL for this delay in sensory/motor response observed in pups during the preweaning period. During the postweaning period, a decrease in motor activity was observed at doses ≥ 15 mg/kg which is 0.5-times the human exposure at the MRHD of 84 mg/day. The NOAEL for maternal toxicity and decreased motor activity during the postweaning period was 4.5 mg/kg/day which was associated with a plasma exposure (AUC) that was 0.07-times the AUC exposure at MRHD of 84 mg/day. Risk SummaryEsketamine is present in human milk. There are no data on the effects of SPRAVATO on the breastfed infant or on milk production. Published studies in juvenile animals report neurotoxicity (see Data). Because of the potential for neurotoxicity, advise patients that breast-feeding is not recommended during treatment with SPRAVATO. DataPublished juvenile animal studies demonstrate that the administration of drugs that block NMDA receptors, such as ketamine, during the period of rapid brain growth or synaptogenesis, results in widespread neuronal and oligodendrocyte cell loss in the developing brain and alterations in synaptic morphology and neurogenesis. Based on comparisons across species, the window of vulnerability to these changes is believed to correlate with exposures in the third trimester of gestation through the first several months of life, but this window may extend out to approximately 3 years of age in humans. ContraceptionBased on published animal reproduction studies, SPRAVATO may cause embryo-fetal harm when administered to a pregnant woman [see Warnings and Precautions (5.10) and Use in Specific Populations (8.1)]. However, it is not clear how these animal findings relate to females of reproductive potential treated with the recommended clinical dose. Consider pregnancy planning and prevention for females of reproductive potential during treatment with SPRAVATO. Abuse Potential StudyA cross-over, double-blind abuse potential study of SPRAVATO and ketamine was conducted in recreational polydrug users (n=34) who had experience with perception-altering drugs, including ketamine. Ketamine, the racemic mixture of arketamine and esketamine, is a Schedule III controlled substance and has known abuse potential. In this study, the mean "Drug Liking at the Moment" and "Take Drug Again" scores for single doses of intranasal SPRAVATO (84 mg and 112 mg – the maximum recommended dose and 1.3 times the maximum recommended dose, respectively) were similar to these scores in the intravenous ketamine (0.5 mg/kg infused over 40 minutes) control group. However, these scores were greater in the SPRAVATO and ketamine groups compared to the placebo group. 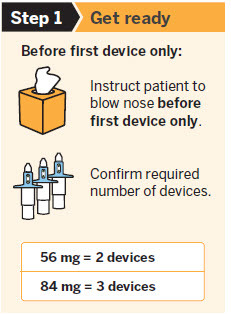 The 112 mg dose of intranasal SPRAVATO was associated with significantly higher scores for "Hallucinating," "Floating," "Detached," and "Spaced Out" than the 84 mg dose of intranasal SPRAVATO and the intravenous ketamine dose. Management of OverdosageThere is no specific antidote for esketamine overdose. In the case of overdose, the possibility of multiple drug involvement should be considered. Contact a Certified Poison Control Center for the most up to date information on the management of overdosage (1-800-222-1222 or www.poison.org). Cardiac ElectrophysiologyThe effect of SPRAVATO (84 mg nasal spray and 0.8 mg/kg esketamine intravenously infused over 40 minutes) on the QTc interval was evaluated in a randomized, double-blind, placebo-, and positive-controlled (moxifloxacin 400 mg), 4-period, crossover study in 60 healthy subjects. A large increase in heart rate (i.e. 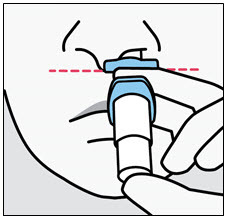 >10 bpm) was observed in both intranasal and intravenous esketamine treatment groups. The totality of evidence from the nonclinical and clinical data indicates a lack of clinically relevant QTc prolongation at the therapeutic dose of esketamine. AbsorptionThe mean absolute bioavailability is approximately 48% following nasal spray administration.The time to reach maximum esketamine plasma concentration is 20 to 40 minutes after the last nasal spray of a treatment session.The inter-subject variability of esketamine ranges from 27% to 66% for Cmax and 18% to 45% for AUC∞. 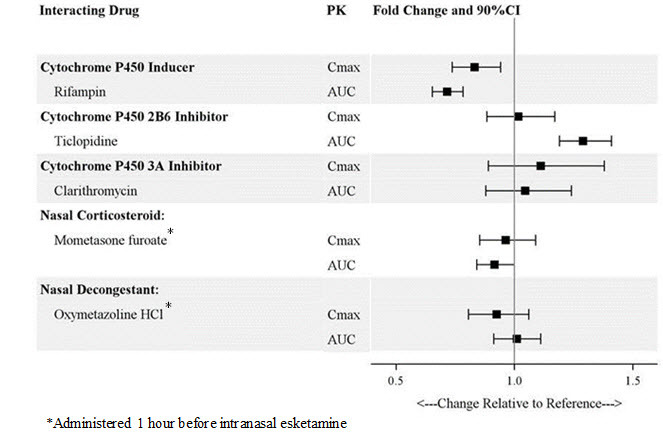 The intra-subject variability of esketamine is approximately 15% for Cmax and 10% for AUC∞. DistributionThe mean steady-state volume of distribution of esketamine administered by the intravenous route is 709 L.Protein binding of esketamine was approximately 43% to 45%.The brain-to-plasma ratio of noresketamine is 4- to 6-times lower than that of esketamine. EliminationAfter Cmax was reached following intranasal administration, the decline in plasma esketamine concentrations was biphasic, with rapid decline for the initial 2 to 4 hours and a mean terminal half-life (t1/2) that ranged from 7 to 12 hours. The mean clearance of esketamine is approximately 89 L/hour following intravenous administration. The elimination of the major metabolite, noresketamine, from plasma is slower than esketamine. The decline of noresketamine plasma concentrations is biphasic, with rapid decline for the initial 4 hours and a mean terminal t1/2 of approximately 8 hours. MetabolismEsketamine is primarily metabolized to noresketamine metabolite via cytochrome P450 (CYP) enzymes CYP2B6 and CYP3A4 and to a lesser extent CYP2C9 and CYP2C19. Noresketamine is metabolized via CYP-dependent pathways and certain subsequent metabolites undergo glucuronidation. ExcretionLess than 1% of a dose of nasal esketamine is excreted as unchanged drug in urine. Following intravenous or oral administration, esketamine-derived metabolites were primarily recovered in urine (≥ 78% of a radiolabeled dose) and to a lesser extent in feces (≤ 2% of a radiolabeled dose). Enzyme Systems: Esketamine has modest induction effects on CYP2B6 and CYP3A4 in human hepatocytes. Esketamine and its major metabolites do not induce CYP1A2. Esketamine and its major circulating metabolites did not show inhibition potential against CYPs and UGTs, except for a weak reversible inhibition of noresketamine on CYP3A4. Transporter Systems: Esketamine is not a substrate of transporters P-glycoprotein (P-gp; multidrug resistance protein 1), breast cancer resistance protein (BCRP), or organic anion transporter (OATP) 1B1, or OATP1B3. Esketamine and its major circulating metabolites do not inhibit these transporters or multi-drug and toxin extrusion 1 (MATE1) and MATE2-K, or organic cation transporter 2 (OCT2), OAT1, or OAT3. CarcinogenesisOnce-daily intranasal administration of esketamine at doses equivalent to 4.5, 15, and 45 mg/kg/day (based on a 200-gram rat) did not increase the incidence of tumors in a 2-year rat carcinogenicity study. At the highest dose, the AUC exposure to esketamine was lower than the human exposure (AUC) at the maximum recommended human dose (MRHD) of 84 mg. Once-daily subcutaneous administration of esketamine up to 75 mg/kg/day (reduced to 40 mg/kg/day during week 17) did not increase the incidence of tumors in a 6-month study in transgenic (Tg.rasH2) mice. MutagenesisRacemic ketamine was not mutagenic with or without metabolic activation in the Ames test, but was positive in an in vitro mouse lymphoma test in the presence of metabolic activation. Intraperitoneally-injected ketamine did not show genotoxic properties in an in vivo bone marrow micronucleus test in mice.Genotoxic effects with esketamine were seen in a screening in vitro micronucleus test in the presence of metabolic activation. However, intravenously-administered esketamine was devoid of genotoxic properties in an in vivo Comet assay in rat liver cells. Impairment of FertilityEsketamine was administered intranasally to both male and female rats before mating, throughout the mating period, and up to day 7 of gestation at doses equivalent to 4.5, 15, and 45 mg/kg/day (based on a 200-gram rat), which are approximately 0.05, 0.3, and 0.6-times the maximum recommended human dose (MRHD) of 84 mg/day based on mean AUC exposures, respectively. Estrous cycle irregularities were observed at the high dose of 45 mg/kg/day and increased time to mate was observed at doses ≥ 15 mg/kg/day without an overall effect on mating or fertility indices. The No Observed Adverse Effect Level (NOAEL) for mating and fertility is 45 mg/kg/day which is 0.6 times the esketamine exposures at MRHD of 84 mg/day. NeurotoxicityIn a single-dose neuronal toxicity study where esketamine was administered intranasally to adult female rats, there were no findings of neuronal vacuolation in the brain up to an estimated dose equivalent of 45 mg/kg for a 200-gram rat with a safety margin of 1.8 and 4.5 times the clinical exposures for AUC and Cmax, respectively, to the MRHD of 84 mg/day. In a second single dose neurotoxicity study conducted with intranasally administered esketamine to adult female rats, there were no findings of neuronal necrosis up to a dose equivalent of 270 mg/kg for a 200-gram rat which has a safety margin of 18-fold and 23-fold, respectively, to AUC and Cmax exposures at the MRHD of 84 mg/day. Neuronal vacuolation was not examined in this study.In a single-dose neuronal toxicity study in adult rats, subcutaneously administered racemic ketamine caused neuronal vacuolation in layer I of the retrosplenial cortex of the brain without neuronal necrosis at a dose of 60 mg/kg. The NOAEL for vacuolation in this study was 15 mg/kg. Estimating 50% of the exposure to be from esketamine, the NOAEL for neuronal vacuolation is 1.6-times and 4.5-times and the NOAEL for neuronal necrosis is 10-times and 16-times exposures, respectively, for AUC and Cmax to the clinical exposure at the MRHD of 84 mg/day. The relevance of these findings to humans is unknown. 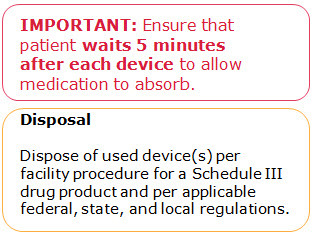 DisposalSPRAVATO nasal spray devices must be handled with adequate security, accountability, and proper disposal, per facility procedure for a Schedule III drug product, and per applicable federal, state, and local regulations. Sedation and DissociationInform patients that SPRAVATO has potential to cause sedation, dissociative symptoms, perception disturbances, dizziness, vertigo, and anxiety. Advise patients that they will need to be observed by a healthcare provider until these effects resolve [see Boxed Warning, Warnings and Precautions (5.1), Warnings and Precautions (5.2)]. Potential for Abuse, Misuse, and DependenceAdvise patients that SPRAVATO is a federally controlled substance because it can be abused or lead to dependence [see Warnings and Precautions (5.3), Drug Abuse and Dependence (9)]. SPRAVATO Risk Evaluation and Mitigation Strategy (REMS)SPRAVATO is available only through a restricted program called the SPRAVATO REMS [see Warnings and Precautions (5.4)]. Inform the patient of the following notable requirements:Patients must be enrolled in the SPRAVATO REMS Program prior to administration.SPRAVATO must be administered under the direct observation of a healthcare provider.Patients must be monitored by a healthcare provider for at least 2 hours after administration of SPRAVATO. Suicidal Thoughts and BehaviorsAdvise patients and caregivers to look for the emergence of suicidality, especially early during treatment and when the dosage is adjusted [see Boxed Warning and Warnings and Precautions (5.5)]. Increases in Blood PressureAdvise patients that SPRAVATO can cause increases in blood pressure. Inform patients that after treatment sessions they should be advised that they may need to be observed by a healthcare provider until these effects resolve [see Warnings and Precautions (5.6)]. Impaired Ability to Drive and Operate MachineryCaution patients that SPRAVATO may impair their ability to drive or operate machinery. Instruct patients not to engage in potentially hazardous activities requiring complete mental alertness and motor coordination such as driving a motor vehicle or operating machinery until the next day after a restful sleep. Advise patients that they will need someone to drive them home after each treatment session [see Warnings and Precautions (5.8)]. PregnancyAdvise pregnant women and women of reproductive potential of the potential risk to a fetus. Advise patients to notify their healthcare provider if they are pregnant or intend to become pregnant during treatment with SPRAVATO. Advise patients that there is a pregnancy exposure registry that monitors pregnancy outcomes in women exposed to SPRAVATO during pregnancy. [See Use in Specific Populations (8.1)]. LactationAdvise women not to breastfeed during treatment with SPRAVATO [see Use in Specific Populations (8.2)]. SPRAVATO™ is indicated, in conjunction with an oral antidepressant, for the treatment of treatment-resistant depression (TRD) in adults [see Clinical Studies (14.1)]. SPRAVATO must be administered under the direct supervision of a healthcare provider. 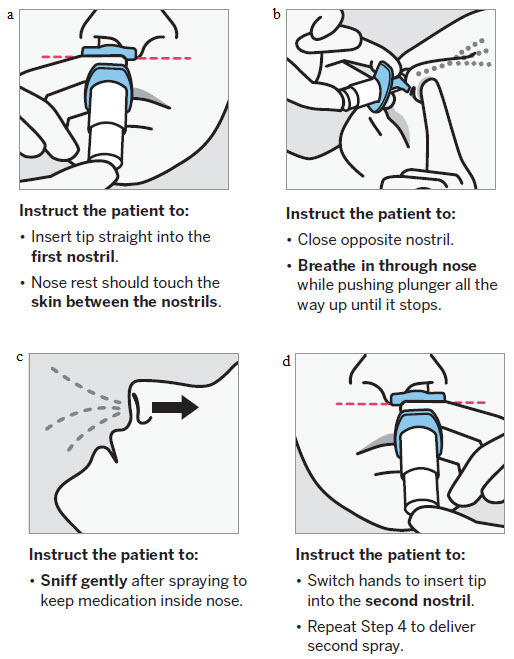 A treatment session consists of nasal administration of SPRAVATO and post-administration observation under supervision. 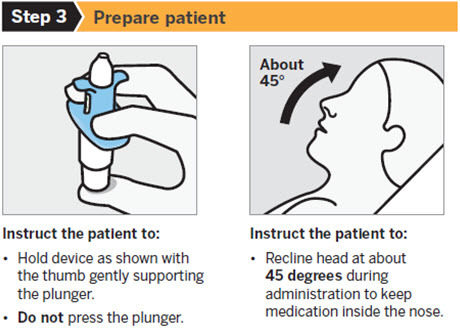 During and after SPRAVATO administration at each treatment session, observe the patient for at least 2 hours until the patient is safe to leave [see Warnings and Precautions (5.1, 5.2, 5.6, 5.8)]. Before SPRAVATO administration, instruct patients not to engage in potentially hazardous activities, such as driving a motor vehicle or operating machinery, until the next day after a restful sleep. If a patient misses treatment sessions and there is worsening of depression symptoms, per clinical judgement, consider returning to the patient's previous dosing schedule (i.e., every two weeks to once weekly, weekly to twice weekly; see Table 1). 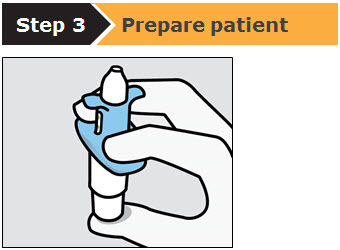 Nasal Spray: 28 mg of esketamine per device. 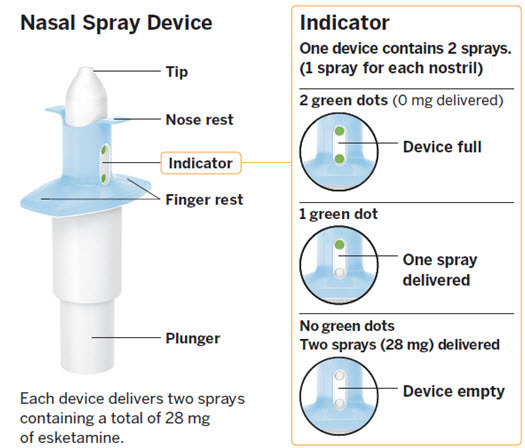 Each nasal spray device delivers two sprays containing a total of 28 mg esketamine. SPRAVATO is contraindicated in patients with:Aneurysmal vascular disease (including thoracic and abdominal aorta, intracranial, and peripheral arterial vessels) or arteriovenous malformation [see Warnings and Precautions (5.6)]History of intracerebral hemorrhage [see Warnings and Precautions (5.5)]Hypersensitivity to esketamine, ketamine, or any of the excipients. In clinical trials, 49% to 61% of SPRAVATO-treated patients developed sedation based on the Modified Observer's Alertness/Sedation scale (MOAA/s) [see Adverse Reactions (6.1)], and 0.3% of SPRAVATO-treated patients experienced loss of consciousness (MOAA/s score of 0).Because of the possibility of delayed or prolonged sedation, patients must be monitored by a healthcare provider for at least 2 hours at each treatment session, followed by an assessment to determine when the patient is considered clinically stable and ready to leave the healthcare setting [see Dosage and Administration (2.4)].Closely monitor for sedation with concomitant use of SPRAVATO with CNS depressants [see Drug Interaction (7.1)].SPRAVATO is available only through a restricted program under a REMS [see Warnings and Precautions (5.4)]. The most common psychological effects of SPRAVATO were dissociative or perceptual changes (including distortion of time, space and illusions), derealization and depersonalization (61% to 75% of SPRAVATO-treated patients developed dissociative or perceptual changes based on the Clinician Administered Dissociative Symptoms Scale) [see Adverse Reactions (6.1)]. Given its potential to induce dissociative effects, carefully assess patients with psychosis before administering SPRAVATO; treatment should be initiated only if the benefit outweighs the risk.Because of the risks of dissociation, patients must be monitored by a healthcare provider for at least 2 hours at each treatment session, followed by an assessment to determine when the patient is considered clinically stable and ready to leave the healthcare setting [see Dosage and Administration (2.4)].SPRAVATO is available only through a restricted program under a REMS [see Warnings and Precautions (5.4)]. SPRAVATO contains esketamine, a Schedule III controlled substance (CIII), and may be subject to abuse and diversion. Assess each patient's risk for abuse or misuse prior to prescribing SPRAVATO and monitor all patients receiving SPRAVATO for the development of these behaviors or conditions, including drug-seeking behavior, while on therapy. Contact local state professional licensing board or state-controlled substances authority for information on how to prevent and detect abuse or diversion of SPRAVATO. Individuals with a history of drug abuse or dependence are at greater risk; therefore, use careful consideration prior to treatment of individuals with a history of substance use disorder and monitor for signs of abuse or dependence. [see Drug Abuse and Dependence (9)].SPRAVATO is available only through a restricted program under a REMS [see Warnings and Precautions (5.4)]. 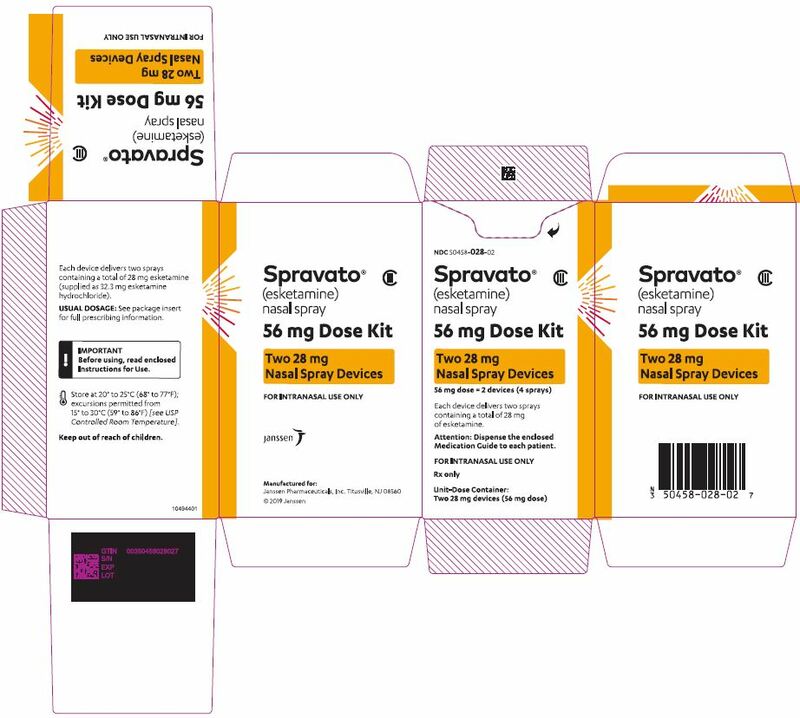 SPRAVATO is available only through a restricted program under a REMS called the SPRAVATO REMS because of the risks of serious adverse outcomes from sedation, dissociation, and abuse and misuse [see Boxed Warning and Warnings and Precautions (5.1, 5.2, 5.3)].Important requirements of the SPRAVATO REMS include the following:Healthcare settings must be certified in the program and ensure that SPRAVATO is:–Only dispensed in healthcare settings and administered to patients who are enrolled in the program.–Administered by patients under the direct observation of a healthcare provider and that patients are monitored by a healthcare provider for at least 2 hours after administration of SPRAVATO [see Dosage and Administration (2.4)].Pharmacies must be certified in the REMS and must only dispense SPRAVATO to healthcare settings that are certified in the program.Further information, including a list of certified pharmacies is available at www.SPRAVATOrems.com or 1-855-382-6022. In pooled analyses of placebo-controlled trials of antidepressant drugs (SSRIs and other antidepressant classes) that included approximately 77,000 adult patients and 4,500 pediatric patients (SPRAVATO is not approved in pediatric patients), the incidence of suicidal thoughts and behaviors in patients age 24 years and younger was greater than in placebo-treated patients. There was considerable variation in risk of suicidal thoughts and behaviors among drugs, but there was an increased risk identified in young patients for most drugs studied. There were differences in absolute risk of suicidal thoughts and behaviors across the different indications, with the highest incidence in patients with major depressive disorder (MDD). The drug-placebo differences in the number of cases of suicidal thoughts and behaviors per 1000 patients treated are provided in Table 2.Table 2:	Risk Differences of the Number of Patients with Suicidal Thoughts or Behaviors in the Pooled Placebo-Controlled Trials of Antidepressants in PediatricSPRAVATO is not approved in pediatric patients. and Adult PatientsAge Range (Years)Drug-Placebo Difference in Number of Patients of Suicidal Thoughts or Behaviors per 1000 Patients TreatedIncreases Compared to Placebo<1814 additional patients18–245 additional patientsDecreases Compared to Placebo25–641 fewer patient≥656 fewer patientsIt is unknown whether the risk of suicidal thoughts and behaviors in children, adolescents, and young adults extends to longer-term use, i.e., beyond four months. However, there is substantial evidence from placebo-controlled maintenance studies in adults with MDD that antidepressants delay the recurrence of depression and that depression itself is a risk factor for suicidal thoughts and behaviors.Monitor all antidepressant-treated patients for clinical worsening and emergence of suicidal thoughts and behaviors, especially during the initial few months of drug therapy and at times of dosage changes. Counsel family members or caregivers of patients to monitor for changes in behavior and to alert the healthcare provider. Consider changing the therapeutic regimen, including possibly discontinuing SPRAVATO and/or the concomitant oral antidepressant, in patients whose depression is persistently worse, or who are experiencing emergent suicidal thoughts or behaviors. SPRAVATO causes increases in systolic and/or diastolic blood pressure (BP) at all recommended doses. Increases in BP peak approximately 40 minutes after SPRAVATO administration and last approximately 4 hours [see Adverse Reactions (6.1)].Approximately 8% to 17% of SPRAVATO-treated patients and 1% to 3% of placebo-treated patients experienced an increase of more than 40 mmHg in systolic BP and/or 25 mmHg in diastolic BP in the first 1.5 hours after administration at least once during the first 4 weeks of treatment. A substantial increase in blood pressure could occur after any dose administered even if smaller blood pressure effects were observed with previous administrations. SPRAVATO is contraindicated in patients for whom an increase in BP or intracranial pressure poses a serious risk (e.g., aneurysmal vascular disease, arteriovenous malformation, history of intracerebral hemorrhage) [see Contraindications (4)]. Before prescribing SPRAVATO, patients with other cardiovascular and cerebrovascular conditions should be carefully assessed to determine whether the potential benefits of SPRAVATO outweigh its risks.Assess BP prior to administration of SPRAVATO. In patients whose BP is elevated prior to SPRAVATO administration (as a general guide: >140/90 mmHg) a decision to delay SPRAVATO therapy should take into account the balance of benefit and risk in individual patients.BP should be monitored for at least 2 hours after SPRAVATO administration [see Dosage and Administration (2.1, 2.4)]. Measure blood pressure around 40 minutes post-dose and subsequently as clinically warranted until values decline. If BP remains high, promptly seek assistance from practitioners experienced in BP management. Refer patients experiencing symptoms of a hypertensive crisis (e.g., chest pain, shortness of breath) or hypertensive encephalopathy (e.g., sudden severe headache, visual disturbances, seizures, diminished consciousness or focal neurological deficits) immediately for emergency care.Closely monitor blood pressure with concomitant use of SPRAVATO with psychostimulants or monoamine oxidase inhibitors (MAOIs) [see Drug Interactions (7.2, 7.3)].In patients with history of hypertensive encephalopathy, more intensive monitoring, including more frequent blood pressure and symptom assessment, is warranted because these patients are at increased risk for developing encephalopathy with even small increases in blood pressure. Two placebo-controlled studies were conducted to assess the effects of SPRAVATO on the ability to drive [see Clinical Studies (14.3)]. The effects of SPRAVATO 84 mg were comparable to placebo at 6 hours and 18 hours post-dose. However, two SPRAVATO-treated subjects in one of the studies discontinued the driving test at 8 hours post-dose because of SPRAVATO-related adverse reactions.Before SPRAVATO administration, instruct patients not to engage in potentially hazardous activities requiring complete mental alertness and motor coordination, such as driving a motor vehicle or operating machinery, until the next day following a restful sleep. Patients will need to arrange transportation home following treatment with SPRAVATO. Cases of ulcerative or interstitial cystitis have been reported in individuals with long-term off-label use or misuse/abuse of ketamine. In clinical studies with SPRAVATO nasal spray, there was a higher rate of lower urinary tract symptoms (pollakiuria, dysuria, micturition urgency, nocturia, and cystitis) in SPRAVATO-treated patients than in placebo-treated patients [see Adverse Reactions (6)]. No cases of esketamine-related interstitial cystitis were observed in any of the studies, which included treatment for up to a year.Monitor for urinary tract and bladder symptoms during the course of treatment with SPRAVATO, and refer to an appropriate healthcare provider as clinically warranted. Based on published findings from pregnant animals treated with ketamine, the racemic mixture of arketamine and esketamine, SPRAVATO may cause fetal harm when administered to pregnant women. Advise pregnant women of the potential risk to an infant exposed to SPRAVATO in utero. Advise women of reproductive potential to consider pregnancy planning and prevention [see Use in Specific Populations (8.1, 8.3)]. Concomitant use with CNS depressants (e.g., benzodiazepines, opioids, alcohol) may increase sedation [see Warnings and Precautions (5.1)]. Closely monitor for sedation with concomitant use of SPRAVATO with CNS depressants. Concomitant use with psychostimulants (e.g., amphetamines, methylphenidate, modafanil, armodafinil) may increase blood pressure [see Warnings and Precautions (5.6)]. Closely monitor blood pressure with concomitant use of SPRAVATO with psychostimulants. Concomitant use with monoamine oxidase inhibitors (MAOIs) may increase blood pressure [see Warnings and Precautions (5.6)]. Closely monitor blood pressure with concomitant use of SPRAVATO with MAOIs. The safety and effectiveness of SPRAVATO in pediatric patients have not been established. Of the total number of patients in Phase 3 clinical studies exposed to SPRAVATO, (N=1601), 194 (12%) were 65 years of age and older, and 25 (2%) were 75 years of age and older. No overall differences in the safety profile were observed between patients 65 years of age and older and patients younger than 65 years of age.The mean esketamine Cmax and AUC values were higher in elderly patients compared with younger adult patients [see Clinical Pharmacology (12.3)].The efficacy of SPRAVATO for the treatment of TRD in geriatric patients was evaluated in a 4-week, randomized, double-blind study comparing flexibly-dosed intranasal SPRAVATO plus a newly initiated oral antidepressant compared to intranasal placebo plus a newly initiated oral antidepressant in patients ≥ 65 years of age. SPRAVATO was initiated at 28 mg twice weekly and could be titrated to 56 mg or 84 mg administered twice-weekly. At the end of four weeks, there was no statistically significant difference between groups on the primary efficacy endpoint of change from baseline to Week 4 on the Montgomery-Asberg Depression Rating Scale (MADRS). The mean esketamine AUC and t1/2 values were higher in patients with moderate hepatic impairment compared to those with normal hepatic function [see Clinical Pharmacology (12.3)]. SPRAVATO-treated patients with moderate hepatic impairment may need to be monitored for adverse reactions for a longer period of time.SPRAVATO has not been studied in patients with severe hepatic impairment (Child-Pugh class C). Use in this population is not recommended [see Clinical Pharmacology (12.3)]. SPRAVATO contains esketamine hydrochloride, the (S)-enantiomer of ketamine and a Schedule III controlled substance under the Controlled Substances Act. Individuals with a history of drug abuse or dependence may be at greater risk for abuse and misuse of SPRAVATO. Abuse is the intentional, non-therapeutic use of a drug, even once, for its psychological or physiological effects. Misuse is the intentional use, for therapeutic purposes, of a drug by an individual in a way other than prescribed by a health care provider or for whom it was not prescribed. Careful consideration is advised prior to use of individuals with a history of substance use disorder, including alcohol.SPRAVATO may produce a variety of symptoms including anxiety, dysphoria, disorientation, insomnia, flashback, hallucinations, and feelings of floating, detachment and to be "spaced out". Monitoring for signs of abuse and misuse is recommended. Physical dependence has been reported with prolonged use of ketamine. Physical dependence is a state that develops as a result of physiological adaptation in response to repeated drug use, manifested by withdrawal signs and symptoms after abrupt discontinuation or significant dosage reduction of a drug. There were no withdrawal symptoms captured up to 4 weeks after cessation of esketamine treatment. Withdrawal symptoms have been reported after the discontinuation of frequently used (more than weekly) large doses of ketamine for long periods of time. Such withdrawal symptoms are likely to occur if esketamine were similarly abused. Reported symptoms of withdrawal associated with daily intake of large doses of ketamine include craving, fatigue, poor appetite, and anxiety. Therefore, monitor SPRAVATO-treated patients for symptoms and signs of physical dependence upon the discontinuation of the drug.Tolerance has been reported with prolonged use of ketamine. Tolerance is a physiological state characterized by a reduced response to a drug after repeated administration (i.e., a higher dose of a drug is required to produce the same effect that was once obtained at a lower dose). Similar tolerance would be expected with prolonged use of esketamine. SPRAVATO contains esketamine hydrochloride, a non-competitive N-methyl-D-aspartate (NMDA) receptor antagonist. Esketamine is the S-enantiomer of racemic ketamine. The chemical name is (S)-2-(o-chlorophenyl)-2-(methylamino)cyclohexanone hydrochloride. Its molecular formula is C13H16ClNO.HCl and its molecular weight is 274.2. The structural formula is:Esketamine hydrochloride is a white or almost white crystalline powder that is freely soluble in water and in methanol, and soluble in ethanol.SPRAVATO nasal spray is intended for nasal administration. 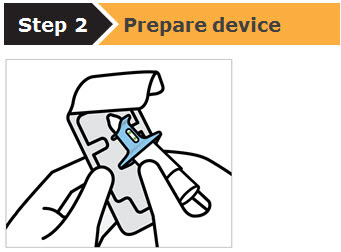 Esketamine hydrochloride is contained as a solution in a stoppered glass vial within the nasal spray device. Each device delivers two sprays with a total of 32.3 mg of esketamine hydrochloride (equivalent to 28 mg of esketamine) in 0.2 mL of a clear, colorless aqueous solution with a pH of 4.5.The inactive ingredients are citric acid monohydrate, edetate disodium, sodium hydroxide, and water for injection. Esketamine, the S-enantiomer of racemic ketamine, is a non-selective, non-competitive antagonist of the N-methyl-D-aspartate (NMDA) receptor, an ionotropic glutamate receptor. The mechanism by which esketamine exerts its antidepressant effect is unknown. The major circulating metabolite of esketamine (noresketamine) demonstrated activity at the same receptor with less affinity. Esketamine exposure increases with dose from 28 mg to 84 mg. The increase in Cmax and AUC values was less than dose-proportional between 28 mg and 56 mg or 84 mg, but it was nearly dose proportional between 56 mg and 84 mg. No accumulation of esketamine in plasma was observed following twice a week administration. Study 2 (NCT02493868) was a long-term randomized, double-blind, parallel-group, multicenter maintenance-of-effect study in adults 18 to <65 years of age who were known remitters and responders to SPRAVATO. Patients in this study were responders in one of two short-term controlled trials (Study 1 and another 4-week study) or in an open-label direct-enrollment study in which they received flexibly-dosed SPRAVATO (56 mg or 84 mg twice weekly) plus daily oral AD in an initial 4-week phase.Stable remission was defined as a MADRS total score ≤ 12 for at least 3 of the last 4 weeks. Stable response was defined as a MADRS total score reduction ≥ 50% for at least 3 of the last 4 weeks and not in remission. 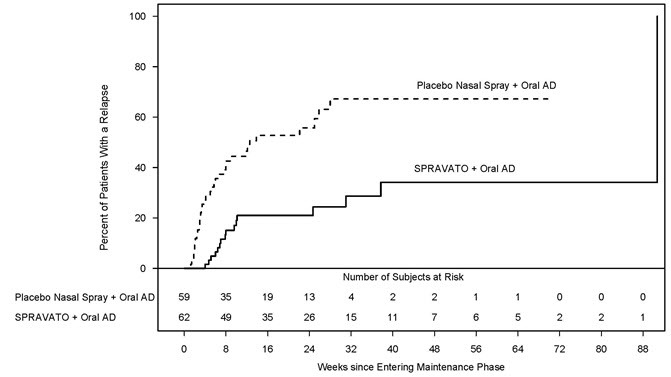 After at least 16 initial weeks of treatment with SPRAVATO and an oral AD, stable remitters and stable responders were randomized separately to continue intranasal treatment with SPRAVATO or switch to placebo nasal spray, in both cases with continuation of their oral AD. The primary study endpoint was time to relapse in the stable remitter group. Relapse was defined as a MADRS total score ≥22 for 2 consecutive weeks or hospitalization for worsening depression or any other clinically relevant event indicative of relapse.The demographic and baseline disease characteristics of the two groups were similar. 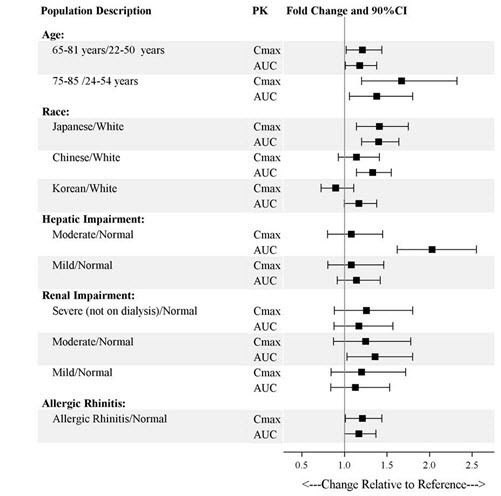 Patients had a median age of 48 years (range 19 to 64 years) and were 66% female, 90% Caucasian, and 4% Black.Patients in stable remission who continued treatment with SPRAVATO plus oral AD experienced a statistically significantly longer time to relapse of depressive symptoms than did patients on placebo nasal spray plus an oral AD (see Figure 5).Figure 5: Time to Relapse in Patients with TRD in Stable Remission in Study 2Note: The estimated hazard ratio (95% CI) of SPRAVATO + Oral AD relative to Placebo nasal spray + Oral AD based on weighted estimates was 0.49 (95% CI: 0.29, 0.84). However, the hazard ratio did not appear constant throughout the trial. (Full Analysis Set)Time to relapse was also significantly delayed in the stable responder population. These patients experienced a statistically significantly longer time to relapse of depressive symptoms than patients on placebo nasal spray plus oral AD (see Figure 6).Figure 6: Time to Relapse in Patients in Stable Response in TRD Patients in Study 2Note: The estimated hazard ratio (95% CI) of SPRAVATO + Oral AD relative to Placebo nasal spray + Oral AD based on Cox proportional hazards model was 0.30 (95% CI: 0.16, 0.55). (Full Analysis Set)In Study 2, based on depressive symptomatology, the majority of stable remitters (69%) received every-other-week dosing for the majority of time during the maintenance phase; 23% of stable remitters received weekly dosing. Among stable responders, 34% received every-other-week dosing and 55% received weekly dosing the majority of time during the maintenance phase. Of the patients randomized to SPRAVATO, 39% received the 56 mg dose and 61% received the 84 mg dose. Two studies were conducted to assess the effects of SPRAVATO on driving skills; one study in adult patients with major depressive disorder (Study 3) and one study in healthy subjects (Study 4). On-road driving performance was assessed by the mean standard deviation of the lateral position (SDLP), a measure of driving impairment.A single-blind, placebo-controlled study in 25 adult patients with major depressive disorder evaluated the effects of a single 84-mg dose of intranasal SPRAVATO on next day driving and the effect of repeated administration of 84 mg of intranasal SPRAVATO on same-day driving performance (Study 3). 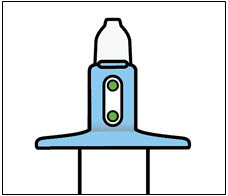 For the single dose treatment phase, an ethanol-containing beverage was used as a positive control. 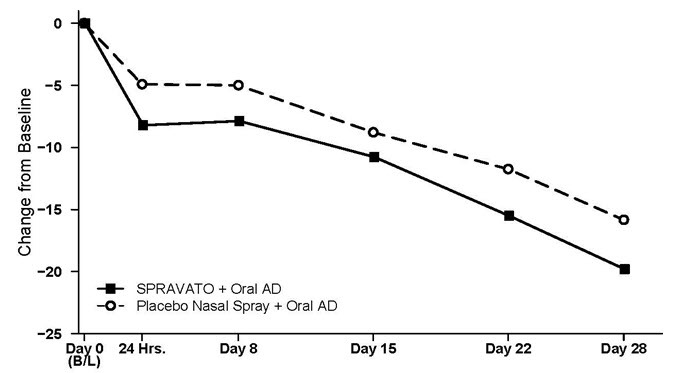 The SDLP after administration of single 84-mg dose of SPRAVATO nasal spray was similar to placebo 18 hours post-dose. For the multiple dose treatment phase, the SDLP after repeated administration of 84 mg intranasal SPRAVATO was similar to placebo 6 hours post-dose on Day 11, Day 18, and Day 25.A randomized, double-blind, cross-over, placebo-controlled study in 23 healthy subjects evaluated the effects of a single 84-mg dose of esketamine nasal spray on driving (Study 4). Mirtazapine (30 mg) was used as a positive control. Driving performance was assessed at 8 hours after SPRAVATO or mirtazapine administration. The SDLP 8 hours after SPRAVATO nasal spray administration was similar to placebo. Two subjects discontinued the driving test after receiving SPRAVATO because of a perceived inability to drive after experiencing post-dose adverse reactions; one subject reported pressure behind the eyes and paresthesia of the hands and feet, the other reported headache with light sensitivity and anxiety. 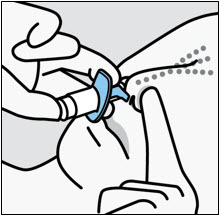 SPRAVATO nasal spray is available as an aqueous solution of esketamine hydrochloride in a stoppered glass vial within a nasal spray device. 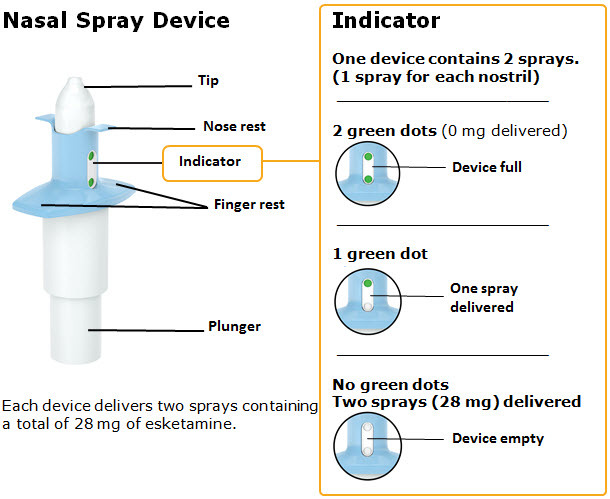 Each nasal spray device delivers two sprays containing a total of 28 mg of esketamine (supplied as 32.3 mg of esketamine hydrochloride).SPRAVATO is available in the following presentations:56 mg Dose Kit: Unit-dose carton containing two 28 mg nasal spray devices (56 mg total dose) (NDC 50458-028-02).84 mg Dose Kit: Unit-dose carton containing three 28 mg nasal spray devices (84 mg total dose) (NDC 50458-028-03).Within each kit, each 28 mg device is individually packaged in a sealed blister (NDC 50458-028-00). StorageStore at 20° to 25°C (68° to 77°F); excursions permitted from 15° to 30°C (59° to 86°F) [see USP Controlled Room Temperature]. This Medication Guide has been approved by the U.S. Food and Drug Administration.Issued: 03/2019 MEDICATION GUIDESPRAVATO™ (sprah vah' toe) CIII(esketamine)nasal sprayWhat is the most important information I should know about SPRAVATO?SPRAVATO can cause serious side effects including:Sedation and dissociation. SPRAVATO may cause sleepiness (sedation), fainting, dizziness, spinning sensation, anxiety, or feeling disconnected from yourself, your thoughts, feelings, space and time (dissociation).Tell your healthcare provider right away if your feel like you cannot stay awake or if you feel like you are going to pass out.Your healthcare provider must monitor you for serious side effects for at least 2 hours after taking SPRAVATO. Your healthcare provider will decide when you are ready to leave the healthcare setting.Abuse and misuse. There is a risk for abuse and physical and psychological dependence with SPRAVATO treatment. Your healthcare provider should check you for signs of abuse and dependence before and during treatment with SPRAVATO.Tell your healthcare provider if you have ever abused or been dependent on alcohol, prescription medicines, or street drugs.Your healthcare provider can tell you more about the differences between physical and psychological dependence and drug addiction.SPRAVATO Risk Evaluation and Mitigation Strategy (REMS). Because of the risks for sedation, dissociation, and abuse and misuse, SPRAVATO is only available through a restricted program called the SPRAVATO Risk Evaluation and Mitigation Strategy (REMS) Program. SPRAVATO can only be administered at healthcare settings certified in the SPRAVATO REMS Program and to patients enrolled in the program.Increased risk of suicidal thoughts or actions. SPRAVATO may cause worsening of depression and suicidal thoughts and behaviors, especially during the first few months of treatment and when the dose is changed. Depression and other serious mental illnesses are the most important causes of suicidal thoughts and actions. Some people may have a higher risk of having suicidal thoughts or actions. These include people who have (or have a family history of) depression or a history of suicidal thoughts or actions.How can I watch for and try to prevent suicidal thoughts and actions?Pay close attention to any changes, especially sudden changes, in mood, behavior, thoughts, or feelings, or if you develop suicidal thoughts or actions.Tell your healthcare provider right away if you have any new or sudden changes in mood, behavior, thoughts, or feelings.Keep all follow-up visits with your healthcare provider as scheduled. Call your healthcare provider between visits as needed, especially if you have concerns about symptoms.Tell your healthcare provider right away if you have any of the following symptoms, especially if they are new, worse, or worry you:attempts to commit suicidethoughts about suicide or dyingworsening depressionother unusual changes in behavior or moodSPRAVATO is not for use in children.What is SPRAVATO?SPRAVATO is a prescription medicine, used along with an antidepressant taken by mouth, for treatment-resistant depression (TRD) in adults.SPRAVATO is not for use as a medicine to prevent or relieve pain (anesthetic). It is not known if SPRAVATO is safe or effective as an anesthetic medicine.It is not known if SPRAVATO is safe and effective in children.Do not take SPRAVATO if you:have blood vessel (aneurysmal vascular) disease (including in the brain, chest, abdominal aorta, arms and legs)have an abnormal connection between your veins and arteries (arteriovenous malformation)have a history of bleeding in the brainare allergic to esketamine, ketamine, or any of the other ingredients in SPRAVATO. See the end of this Medication Guide for a complete list of ingredients in SPRAVATO.If you are not sure if you have any of the above conditions, talk to your healthcare provider before taking SPRAVATO.Before you take SPRAVATO, tell your healthcare provider about all of your medical conditions, including if you:have heart or brain problems, including:high blood pressure (hypertension)slow or fast heartbeats that cause shortness of breath, chest pain, lightheadedness, or faintinghistory of heart attackhistory of strokeheart valve disease or heart failurehistory of brain injury or any condition where there is increased pressure in the brainhave liver problemshave ever had a condition called "psychosis" (see, feel, or hear things that are not there, or believe in things that are not true).are pregnant or plan to become pregnant. SPRAVATO may harm your baby. You should not take SPRAVATO if you are pregnant.Tell your healthcare provider right away if you become pregnant during treatment with SPRAVATO.If you are able to become pregnant, talk to your healthcare provider about methods to prevent pregnancy during treatment with SPRAVATO.There is a pregnancy registry for women who are exposed to SPRAVATO during pregnancy. The purpose of the registry is to collect information about the health of women exposed to SPRAVATO and their baby. If you become pregnant during treatment with SPRAVATO, talk to your healthcare provider about registering with the National Pregnancy Registry for Antidepressants at 1-844-405-6185 or online at https://womensmentalhealth.org/clinical-and-research-programs/pregnancyregistry/antidepressants/.are breastfeeding or plan to breastfeed. You should not breastfeed during treatment with SPRAVATO.Tell your healthcare provider about all the medicines that you take, including prescription and over-the-counter medicines, vitamins and herbal supplements. Taking SPRAVATO with certain medicine may cause side effects. Especially tell your healthcare provider if you take Central Nervous System (CNS) depressants, psychostimulants, or Monoamine oxidase inhibitors (MAOIs) medicines.How will I take SPRAVATO?You will take SPRAVATO nasal spray yourself, under the supervision of a healthcare provider in a healthcare setting. 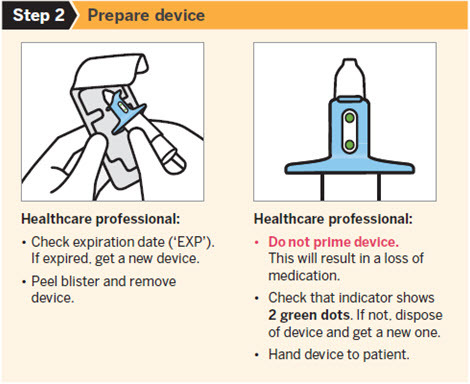 Your healthcare provider will show you how to use the SPRAVATO nasal spray deviceYour healthcare provider will tell you how much SPRAVATO you will take and when you will take it.Follow your SPRAVATO treatment schedule exactly as your healthcare provider tells you to.During and after each use of the SPRAVATO nasal spray device, you will be checked by a healthcare provider who will decide when you are ready to leave the healthcare setting.You will need to plan for a caregiver or family member to drive you home after taking SPRAVATO.If you miss a SPRAVATO treatment, your healthcare provider may change your dose and treatment schedule.Some people taking SPRAVATO get nausea and vomiting. You should not eat for at least 2 hours before taking SPRAVATO and not drink liquids at least 30 minutes before taking SPRAVATO.If you take a nasal corticosteroid or nasal decongestant medicine take these medicines at least 1 hour before taking SPRAVATO.What should I avoid while taking SPRAVATO?Do not drive, operate machinery, or do anything where you need to be completely alert after taking SPRAVATO. Do not take part in these activities until the next day following a restful sleep. See "What is the most important information I should know about SPRAVATO? "What are the possible side effects of SPRAVATO?SPRAVATO may cause serious side effects including:See "What is the most important information I should know about SPRAVATO"Increased blood pressure. SPRAVATO can cause a temporary increase in your blood pressure that may last for about 4 hours after taking a dose. Your healthcare provider will check your blood pressure before taking SPRAVATO and for at least 2 hours after you take SPRAVATO. Tell your healthcare provider right away if you get chest pain, shortness of breath, sudden severe headache, change in vision, or seizures after taking SPRAVATO.Problems with thinking clearly. Tell your healthcare provider if you have problems thinking or remembering.Bladder problems. Tell your healthcare provider if you develop trouble urinating, such as a frequent or urgent need to urinate, pain when urinating, or urinating frequently at night.The most common side effects of SPRAVATO when used along with an antidepressant taken by mouth include:dissociationdizzinessnauseasedationspinning sensationreduced sense of touch and sensationanxietylack of energyincreased blood pressurevomitingfeeling drunkIf these common side effects occur, they usually happen right after taking SPRAVATO and go away the same day.These are not all the possible side effects of SPRAVATO.Call your doctor for medical advice about side effects. You may report side effects to FDA at 1-800-FDA-1088.General information about the safe and effective use of SPRAVATO.Medicines are sometimes prescribed for purposes other than those listed in a Medication Guide. You can ask your pharmacist or healthcare provider for information about SPRAVATO that is written for health professionals.What are the ingredients in SPRAVATO?Active ingredient: esketamine hydrochlorideInactive ingredients: citric acid monohydrate, edetate disodium, sodium hydroxide, and water for injectionManufactured by: Renaissance Lakewood LLC, Lakewood, NJ 08701Manufactured for: Janssen Pharmaceuticals, Inc., Titusville, NJ 08560© 2019 Janssen Pharmaceutical CompaniesFor more information, go to www.SPRAVATO.com or call 1-800-526-7736.